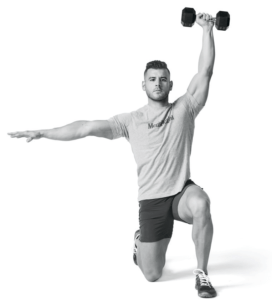 The strength move that increases speed. 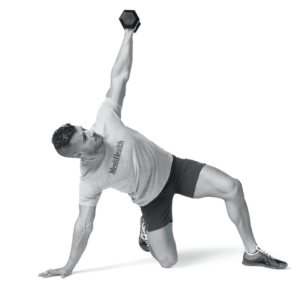 This exercise, also known as the Turkish get-up is an old-school strongman move, but it’s also beneficial for cyclists and runners. 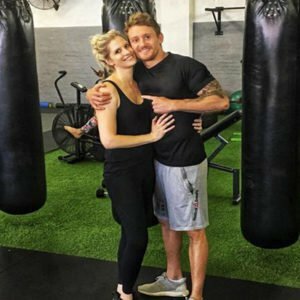 It strengthens your legs and core, improves flexibility and protects your body from injury, says Jim Ferris of Gym Ferris Fitness. As the ultimate strength builder – during your lifting routine, do 5 sets of 1 rep on each side, using a heavy dumbbell. As a lung-taxing finisher – After any workout, do 10 sets of 5 reps on each side, using a 5kg dumbbell. As a single-exercise workout – One day a week, grab a 10kg dumbbell and do as many controlled reps as you can in 20 minutes. Related: What Should You Do When Running Gets Boring? Lie on your back with your left leg bent and right leg flat on the floor. 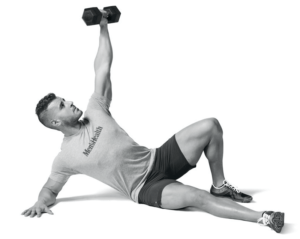 Hold a dumbbell in your left hand and raise your left arm straight towards the ceiling (keep it like this the whole time). 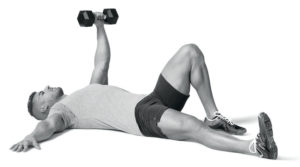 Keep your eye on the dumbbell as you slowly roll your torso to the right and lean on your right forearm. Your palm should be pressing into the floor and your leg still straight. Related: Kings Of The Road: Running Vs Cycling, Who Wins? Lift your hips and push up onto your right hand. 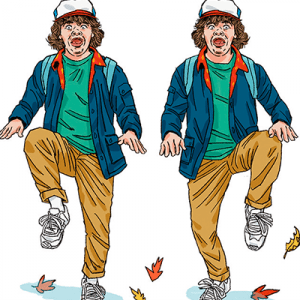 As you do, slide your right leg under your body, moving into a partial half kneel: put your weight on your right hand, right knee, and left foot. 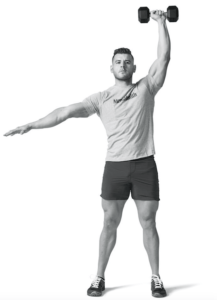 Now raise your torso so it’s vertical; keep your left arm pressing the weight up and your right arm out to your side. Both knees should be bent 90-degrees and your eyes should look forward. From the half kneel, drive your weight through your left foot and stand tall, keeping the weight vertical as you do. 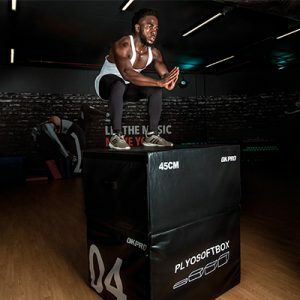 At the top, squeeze your glutes. Now do the entire move in reverse.